You are an assistant working for Professor Burnet, a researcher of the "Interdream Zone", where the Pokémon world interacts with reality. 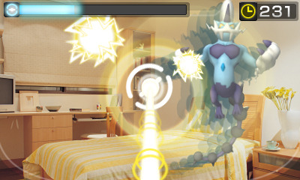 By moving the Nintendo 3DS around you, fire a light beam at the Dream Clouds to reveal Pokémon and other rewards. Any Pokémon you catch can be transferred to Pokémon: Black 2 & White 2.